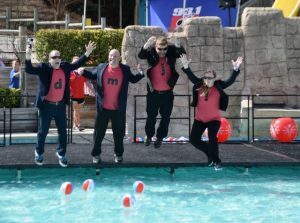 It takes a healthy mix of nerve and a sense of adventure to participate in the Polar Plunge for Special Olympics North Carolina. But for the past 17 years, my colleagues at DMJ have not only braved the icy waters in frigid temperatures, sacrificed their personal time, and participated in fundraising efforts leading up to this event; but have done all of it during a time of the year in which we, as CPAs, do not have any time to spare – tax season. As a cycling coach and step-parent of a Special Olympic athlete, I not only appreciate their willingness to do so but have seen firsthand the positive impact of this organization. The 25 athletes that I have helped coach for the past 25 years have benefited directly from Special Olympics and so have the many coaches and volunteers of this organization who carry on its mission. There is nothing like seeing the joy on an athlete’s face when he is able to ride a bike for the first time or when he has trained all summer and can now ride well enough to participate in a 5K road race — both things that he was told he would never be able to do. Special Olympics provides training, support, community, inclusion, and participation for athletes with no cost to them or their families. That’s right, no cost. It is the generosity of individuals like my coworkers and those individuals who donate to this organization that makes this possible. It is my belief that Special Olympics is a step in the right direction towards Mrs. Shriver’s mission.